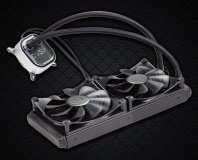 Corsair has officially unveiled a low-profile all-in-one liquid cooler which it hopes will bring the technology to those with cases too cramped for a traditional 120mm or 240mm radiator system - by hovering the radiator above the motherboard. 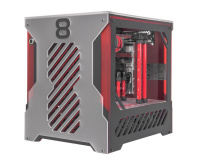 Designed for mITX systems, the Corsair Hydro Series H5 SF is certainly an odd-looking beast: rather than the traditional design of a radiator with a standard fan attached to the side and built to mount on a case's exhaust fan outlet, the H5 SF turns things on its side with a centrifugal blower which pushes air through a long, flat radiator. 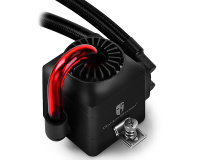 Facing downwards, this blower is claimed to help cool system components as well as the radiator itself. From there, things start to look a little more traditional: a copper water block connects to the radiator through low-permeability flexible tubing, while the whole system is pre-filled with coolant and has thermal compound pre-applied to get even liquid cooling novices up and running as quickly as possible. Adding 84mm height to the motherboard, the H5 SF is claimed to be able to handle even high-end chips: paired with an 84W Intel Core i7-4790K processor, the H5 SF was able to keep the temperature down to 69 degrees Celsius, where both an Intel stock HSF and a 'premium SFF air cooler' saw the system shut down due to excessive heat. The Corsair H5 SF is available now, priced at £79.99. More information is available on the company's official product page.